Sky Light Center provides an individualized path to recovery for all through psychiatric rehabilitation services that significantly impact and improve overall quality of life. We believe our community is a haven of support, fellowship, encouragement, exploration and opportunity which is member driven. We strive to affirm member’s talents, strengths and skills by expressing the need for them in the day-to-day operation of the clubhouse. We focus on the wellness of a person rather than the illness. Our decision-making process is inclusive, collaborative and respects the dignity and worth of each individual. This opens the doors to mutual ownership. Members’ individuality and their right to choose permeates every Sky Light Center opportunity. We create opportunities for each member to find a voice in fighting stigma and discrimination through advocacy and education. 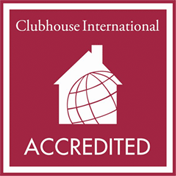 Sky Light Center is an accredited member of Clubhouse International. This certification is based on the International Standards for Clubhouse Programs. These Standards are best practices agreed on by consensus of the world-wide Clubhouse community and they define the Clubhouse model of psychiatric rehabilitation. The Standards are based on the values and principles that have driven Clubhouses such as Sky Light to excel in their work of helping adults recovering from psychiatric disabilities stay out of the hospital and achieve social, financial, and vocationally viable lives. Sky Light Center’s accreditation is a credential that affirms that it is operating as a Clubhouse and is in substantial compliance with the International Standards for Clubhouse Programs. The Clubhouse model is also listed on SAMHSA's National Registry of Evidence based Programs and Practices. As with all Clubhouse model programs, Sky Light Center is a therapeutic community comprised of both people who are recovering from psychiatric disabilities and generalist staff who work within the program. Work is the focus of Sky Light Center - in the form of voluntary services within the club and as paid employment in the community. Consumers who are part of the program are called members, not patients or clients, because the program is first and foremost a club with definite rights of membership, including the choice of work activities or whether or not to work at all, choice in the selection of a staff worker, and lifetime right of re-entry and community support services. However, rights of membership are balanced by member responsibilities. Members are expected to assist in operating Sky Light Center by taking on essential tasks, thus reversing the typical provider-recipient role in mental health services. Sky Light Center sends a clear message to members that they are capable, competent, wanted and needed.